There are quite a few varieties of caterpillars on our earth. In Japan too, we have our share of them. Basically they are divided into the hairy versions and the non-hairy ones. kemushi can be used for any type of hairy caterpillar of any size. Woolybear refers to the tiger moth species (Arctiide). Woolybears are also seen in autumn, when they walk along the roads. In that case, as kigo, you have to mention the season, they are "autumn woolybears". Some of them have poison on their hairs that can lead to severe inflammation of the human skin. Some multiply in great numbers and crawl along fields and trees, they can clear a whole chestnut tree over night, as I have seen them many times in our area. They come down our small road like an army of small tanks. The local farmers call them "Mountain guys" (yama taroo 山太郎). When they become too much of a plague, farmers light torches and burn them off (kemushi yaku 毛虫焼く). What is left will be food for the crows, which descend in large numbers to feed on the hairy caterpillars. Another group are the loopers, which move by drawing the rear part of the body to the front part, forming a loop, and then moving the front part onwards. The body movement looks like the animal is measuring the lenght of a SHAKU or a SUN to the Japanese. If it's a hairy caterpillar, say "hairy caterpillar" or "woolybear". This is what the Japanese call kemushi. If it's a non-hairy caterpillar, and is green or brownish in color, say "looper" or "inch-worm" or some such. Japanese shakutori . In my own reading, I automatically classify the word "caterpillar" by itself as the latter type unless context suggests otherwise, but I'm sure others may think first of a woolybear. Then, there are also horned caterpillars, tent caterpillars, and other types. In some poems, for example one involving a bird eating a caterpillar, it may not make much difference which type is mentioned. But if the caterpillar is the main star, rather than a supporting actor, it might be a good idea to say which kind, within reason. A "green caterpillar" may be enough in some haiku (suggesting either the caterpillar of a cabbage white or an inch-worm), while in others one might need to specify "gypsy moth caterpillar". The woolly bear caterpillar — with its 13 distinct segments of black and reddish-brown — has the reputation of being able to forecast the coming winter weather. There are many tens and thousands of types of caterpillars. certainly, as poets, we can evoke a familiar moment in our fellow haijin by saying 'caterpillar'. and maybe, unless the precise species is needed to capture the moment, caterpillar is all we need say. have a hardened head capsule and a fleshy body composed of a thorax bearing three pairs of legs, and an elongated cylindrical abdomen bearing from zero to five pairs of prolegs (short fleshy ventral projections used for clinging or walking). The body may be either uniformly colored or patterned with stripes, bands, or spots; the surface may be smooth, or may be sparsely or densely covered with short or long hairs, tufts of hair, spines, knobs, or other features. The caterpillar of the Spotted Tussock Moth is often called the Yellow Woolly Bear. Spotted Tussock Moth Caterpillar / PHOTO ! Photo by: John Serrao/Photo Researchers, Inc.
Caterpillar Hunter, common name for any of several closely related species of large, nocturnal, predatory beetles. Caterpillar hunters prey on caterpillars and earthworms. Some, such as the fiery searcher, are brilliantly colored. This species, which can grow up to 3.4 cm (1.3 in) long, is metallic blue and green. The European caterpillar hunter was imported into the United States in large numbers to combat the browntail moth. Caterpillar hunters belong to the family Carabidae. 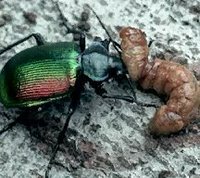 The fiery searcher is classified as Calosoma scrutator, and the European caterpillar hunter as Calosoma sycophanta.
. WKD : Yosa Buson 与謝蕪村 and his "short night" poems . namushi 菜虫 (なむし) "leaf worm"
This is the caterpillar stage of the cabbage butterfly (monchirochoo もんしろちょう 紋白蝶 . Starting verse for a renga party at Jokoo's house in Oogaki. Written shortly after arrival in Oogaki on or around October 4. Read a discussion about the RAUPE in German. At this time of the year, we have hairy caterpillars, which have not yet grown into large and beautiful butterflies. Sometimes, they venture into our houses, we know not why, and we may come across them in unexpected places, such as on our beds. they escape our notice. Their hairs have the ability to enter our skin and break off there, causing highly allergic reactions and even inflammations. No animal will eat them. The hairy skins, even when shed, keep their ability to cause skin irritations. roger tory peterson's field guides have drawings and photos of the larval forms of many caterpillars and moths. my copy of 'moths' has photos of 18, and nice photos of cocoons. these are available in paperback thru amazon. killing them. instead, i now plant lots of parsley (one of their preferred foods). sometimes i am rewarded with a chrysalis and get to watch a swallowtail emerge. if you are standing nearby, you can feel the butterfly's altered state when she deposits her eggs.